This small American copper butterfly spreads its wings to bask in the sun on a gravel path, revealing the flashy, metallic orange that gives this butterfly its name. Among the colorful leaves and grasses of October, it’s still possible to spot an occasional butterfly, such as the small but fiery American copper. A sighting of an American copper (Lycaena phlaeas) this month is a good reminder that butterfly season closes surprisingly late, in October or even November, depending on the weather. The season also opens earlier than we usually realize, in the first warm days of March or April. It peaks in July, when it’s easy to see butterflies. You might notice an American copper at any time during this span of time. American coppers are small, with a wingspan of only about an inch, so they’re easy to overlook. They often fly near the ground, but that’s exactly where many people spend their time looking – down – when they’re out walking on trails and watching where they step. You can see more than your feet when you watch the ground! If your eye catches flashes of orange in a fast fluttering flight, you may have noticed an American copper. 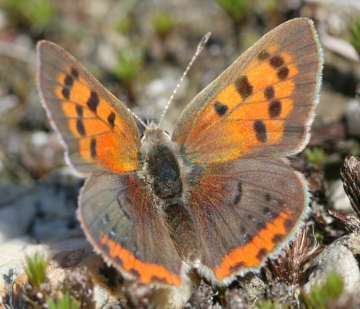 When this butterfly perches on a low plant with its wings closed, it shows the gray undersides of its wings, but hints of orange peek through. That orange is a good clue that you’re looking at an American copper rather than some totally drab insect. You’ll get to see the bright coppery glow that gives this butterfly its name if you watch until it opens its wings to bask in the sun, warming its body for a quick flight. It might do this while sitting on a flower, such as a late-blooming goldenrod, or on the warm gravel or sand on a trail. Many butterflies are orange – think of monarchs, viceroys, and fritillaries – but what gives the American copper its special bright metallic glint? Like other butterflies, its wings are covered with tiny scales that overlap like shingles. These scales look like feathers or dust to our naked eye. The various colors on its scales come about in different ways. Some colors, including browns, grays, and many oranges, come from pigments in the scales. Like paints, the pigments absorb some wavelengths of light and reflect others, creating the colors we see. But fiery or metallic colors, such as the glowing copper color, don’t come from pigments. Instead, these colors come from the microscopic structure of certain scales on the butterfly’s wing. These scales are like small grates that reflect light in ways that intensify certain wavelengths and cancel out others, giving the wing a shimmering copper color. But what’s the point? How does a flashy metallic glint help the butterfly? It makes the flight of this butterfly harder for predators, such as birds, to follow. If you try to watch an American copper in flight – here a flash of copper, over there a flash of copper – you’ll see how its changing appearance in flight might be confusing to predators. It’s almost as if the butterfly winks in and out of existence as it flies. Its coppery color isn’t the only thing that’s fiery about this butterfly. American coppers are feisty and territorial, although we don’t usually think of butterflies as being that way. Tiny American coppers often come flying off their perch to chase away other butterflies and insects. Not only do they go after other small butterflies such as blues, but you might also see one taking after a much larger monarch. Such conflicts are likely at this time of year, when only a few flowers still offer nectar. If you notice an American copper – or another butterfly – near a fresh flower, watch the flower for a while. The butterfly may keep coming back to it. What are some promising places to keep an eye out for American coppers on a warm fall day? Dry fields with low or sparse vegetation are best. Areas with sand or gravel can be good spots for these butterflies to warm up. Minuteman Park along Upton Road might be a good place to look. Power line cuts, such as the one on the trail to WCLT’s Hero property (near the Haskell Street ball fields) often have weedy, open areas. Look for isolated, late-blooming goldenrods or asters. Check out the large, lush stand of late-blooming goldenrod on Oak Street in a disturbed area opposite the DPW facility. It’s currently attracting all sorts of nectar-seeking insects, including migrating monarchs. There are also some other wildflowers that normally bloom mainly in July. What plants serve as food for the caterpillars of the American copper? They are common weeds that aren’t in short supply: sheep sorrel (Rumex acetosella) and curly dock (Rumex crispus). They grow in old fields, along roadsides and railroad tracks and woodland edges, and in power line cuts. You probably wouldn’t choose them for a butterfly garden, but it wouldn’t hurt to have growing them nearby. In our area we probably get three generation of American coppers between April and October. The last caterpillars of the season form their chrysalises late in the year, spend the winter in that stage, and emerge as butterflies in early spring. Are American coppers native butterflies? Given the name, you’d think so, but there’s some controversy about the origin of these butterflies. The weeds that feed their caterpillars came from Europe with early settlers and were naturalized here, so some experts believe the same thing happened with the butterflies. American coppers may be a form of the “small coppers” found in Europe and elsewhere. Genetic research may eventually provide an answer. While you’re looking for October butterflies, you’re likely to see one that did come from Europe, the cabbage white (Pieris rapae). You might spot a monarch (Danaus plexippus), winging its way toward Mexico on its migration. (Notice what direction it seems to be heading – south, perhaps?) Small blue butterflies may still be around, such as Eastern tailed blues (Everes comyntas) or summer azures (Celastrina ladon neglecta), with gray on the undersides of their wings (similar to American coppers) but blue on top.